Thomas McMinn was the son of Samuel and Margaret Jane McMinn. Thomas was born on 15th April 1885 in Crossdernot Rock, Dungannon, Co. Tyrone. Thomas emigrated to New Zealand. 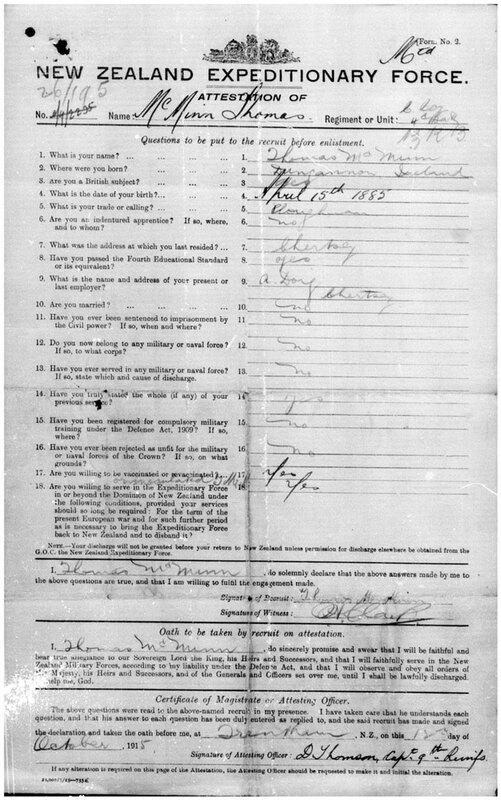 Thomas McMinn enlisted in New Zealand on 15th October 1915. He was 30 years old. After training, Rifleman Thomas McMinn embarked for Suez, Egypt with C Company, 4th Battalion of the New Zealand Rifle Brigade on 5 February 1916 from Wellington, New Zealand. 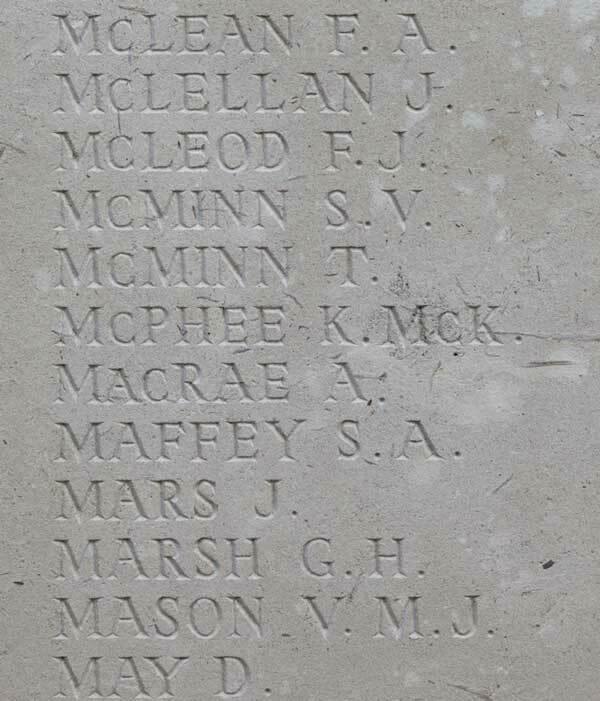 Rifleman Thomas McMinn was serving with the New Zealand Rifle Brigade when he was killed in action in France on 15th September 1916. He was 31 years old. Thomas McMinn was the son of Samuel and Margaret Jane McMinn. Thomas was born on 15th April 1885 in Crossdernot Rock, Dungannon, Co. Tyrone. The 1901 census lists Thomas as age 15 living with his family at house 5 in Crossdernot, Tyrone. The family work a farm. Thomas has left school. The 1911 census does not lists Thomas as living with his family at house 11 in Crossdernot, Tyrone. The family were still farming. All: Samuel McMinn, Margaret McMinn, Mary Jane McMinn (born about 1879), Samuel McMinn (born about 1881), John McMinn (born about 1883), Thomas McMinn (born about 1886), Hugh McMinn (born about 1888), Jeremiah McMinn (born about 1890), Ann McMinn (born about 1893), Margaret McMinn (born about 1895), Richard McMinn (born about 1898), Catherine McMinn (born about 1901), Joseph McMinn (born about 1903). Thomas emigrated to New Zealand. 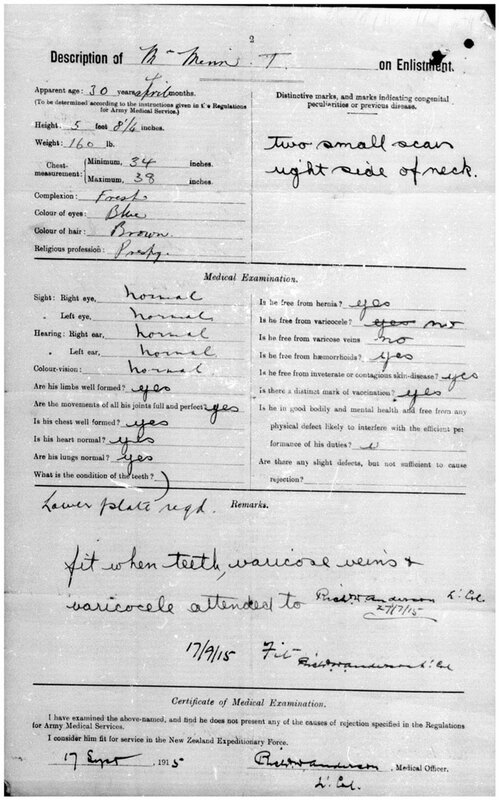 Thomas McMinn enlisted at Trentham Military Camp, near Wellington in New Zealand on 15th October 1915. He was 30 years old. On enlistment, he gave his occupation as ploughman. He was working and living in Chertoy (? ), New Zealand for Mr A Doy (?). After training, Rifleman Thomas McMinn embarked for Suez, Egypt with C Company, 4th Battalion of the New Zealand Rifle Brigade on 5 February 1916 from Wellington, New Zealand. Rifleman Thomas McMinn was serving with the New Zealand Rifle Brigade when he was killed in action in France on 15th September 1916. He was 31 years old. Mr Samuel McMinn, Crossdernot, received a telegram on Saturday afternoon intimating that his son, Rifleman Thomas McMinn, New Zealand Expeditionary Force, has been killed in action. Mr Samuel McMinn, Crossdernot, Donaghmore, County Tyrone, received a telegram on Saturday afternoon intimating that his son, Rifleman Thomas McMinn, New Zealand Expeditionary Force, had been killed in action on 16th September. The deceased soldier had emigrated to Australia a few years ago. 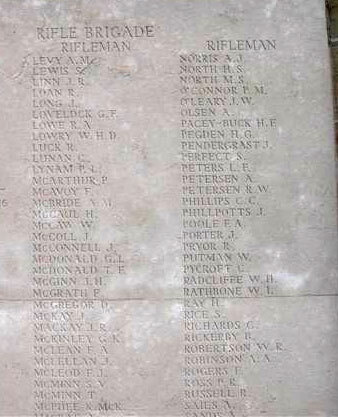 Rifleman Thomas McMinn is commemorated on a Caterpillar Valley (New Zealand) Memorial, in Caterpillar Valley Cemetery in the Somme, France. 5 Jeremiah Mc Minn - brother Also served with NZEF, but survived.